As of this writing, Disney Animation’s Zootopia remains number one at the box office in the USA and several other countries, breaking records left and right for an animated film — Disney or otherwise. 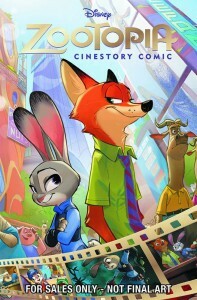 Now Joe Books (no, we don’t know who they are either) bring Zootopia to their Cinestory series of comic book adaptation. Telling the story of plucky bunny cop Judy Hopps and “articulate” fox Nick Wilde in the all-mammal city of Zootopia, using full-color stills from the movie in comic form. Diamond Distributors have more information about it. image c. 2016 Joe Books, Inc.